The Farmhouse Star Quilt Collection features a unique palette of ivory, oatmeal, and a soft black that is almost a deep dark blue. 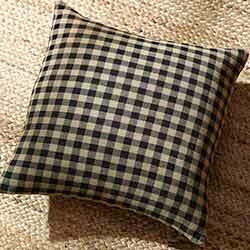 Patchworking is of stars and squares, with coordinating check pattern and ticking stripes. 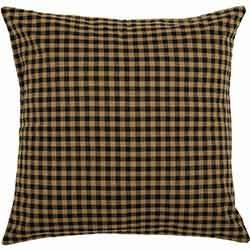 A great addition to any room, this classic pillow is versatile and transitions easily from room to room, season to season. Farmhouse Star Quilt, by Lasting Impressions. The Farmhouse Star Collection features a unique palette of ivory, oatmeal, and a soft black that is almost a deep dark blue. Patchworking is of stars and squares, with coordinating check pattern and ticking stripes. Farmhouse Star Quilt, by Lasting Impressions. The Farmhouse Star Collection features a unique palette of ivory, oatmeal, and a soft black that is almost a deep dark blue. Patchworking is of stars and squares, with coordinating check pattern and ticking stripes. 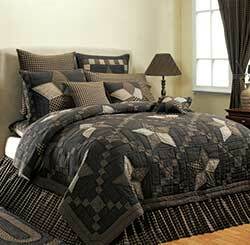 This is for the Luxury King quilt, which measures 120 x 105 inches. 100% cotton shell with surgical cotton fill, machine pieced, hand quilted. Machine washable, see label for care instructions. Other matching accessories available! Farmhouse Star Quilt, by Lasting Impressions. The Farmhouse Star Collection features a unique palette of ivory, oatmeal, and a soft black that is almost a deep dark blue. Patchworking is of stars and squares, with coordinating check pattern and ticking stripes. This is for the Twin quilt, which measures 70 x 90 inches. 100% cotton shell with surgical cotton fill, machine pieced, hand quilted. Machine washable, see label for care instructions. Other matching accessories available! Farmhouse Star Quilted Throw, by Lasting Impressions. Farmhouse Star is a striking collection of homespun print fabrics in blacks, beige, and ecru, accented with star motifs. This is for the Quilted Throw. Measures 50 x 60 inches. 100% cotton shell and lining, machine pieced, hand quilted. Features a rod pocket on back. Other matching items in the collection also available!